PG&E operates one of the cleanest fleets in the utility industry and advances clean fleet technologies that support local economies in our service area. 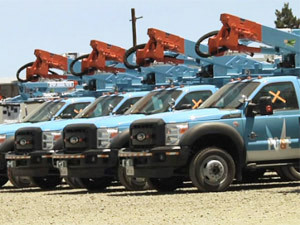 From electric hybrid bucket trucks to extended-range pickups, PG&E actively invests in new vehicle technologies to support local businesses and reduce emissions and operating costs. PG&E remains committed to meeting federal and state vehicle emission and alternative fuel requirements. Federal regulations require that 90 percent of all light-duty vehicles purchased for our fleet be capable of using an alternative fuel—such as electricity or compressed natural gas—provided the technology is commercially available. California regulations require that we turn over our entire fleet to meet new U.S. EPA tailpipe emission standards by 2017. All heavy-duty diesel vehicles in PG&E’s fleet must meet or exceed 2007 standards for particulate levels and 2010 standards for nitrogen oxide emissions. PG&E’s leadership in this area is clear: 97 percent of our fleet is already compliant with the 2007 standards and more than 70 percent is compliant with the 2010 standards. We are also working to meet these requirements in a way that fosters innovation and economic vitality by partnering with vehicle manufacturers to design and test new types of vehicles and technologies. With up to 120 kW of exportable power, the trucks could power a neighborhood as crews make repairs. Electric hybrid utility truck. This Class 5 utility truck features exportable power capable of supplying 120 kW, which allows the vehicle to be plugged directly into the grid and power up to 100 homes during outages. Manufactured by locally-based Efficient Drivetrains Incorporated (EDI), this vehicle features an 80 percent improvement in fuel efficiency when compared to conventional trucks and an 80 percent reduction in carbon emissions when operating in hybrid mode. PG&E battery-powered bucket trucks at Altec Industries Inc.’s green-fleet facility in Dixon. Battery-powered bucket trucks. These first-of-their kind trucks feature technology developed by PG&E and Altec Industries that allows the vehicle’s engine to rest while at the job site. A plug-in battery-powered system called JEMS operates the auxiliary systems of the trucks, including the bucket, lights, hydraulic lifts, heating and air conditioning, and tools. In 2014, PG&E deployed JEMS technology in 610 trucks, with plans to have more than 700 of these battery-powered bucket trucks in our fleet by the end of 2015. The extended-range pick-up truck from VIA Motors runs on electric power for the first 40 miles. Extended-range electric pickup truck. PG&E is working with VIA Motors to develop a pickup truck with a 40-mile electric range and 15 kilowatts of exportable power that allows crews to power their tools and lights on the job. 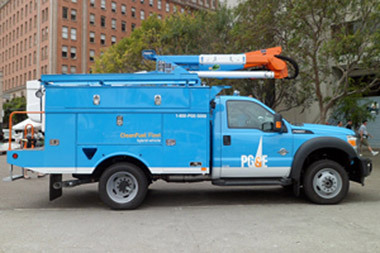 In 2014, PG&E continued testing the trucks and has added three to our fleet in 2015. 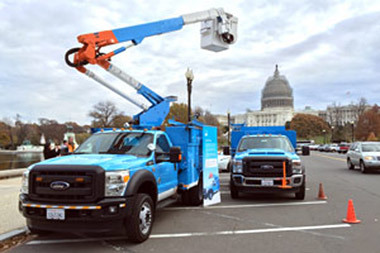 During a Capitol Hill event, PG&E unveiled two innovative new electric hybrid utility trucks, one of which can provide power to up to 100 homes during outages. 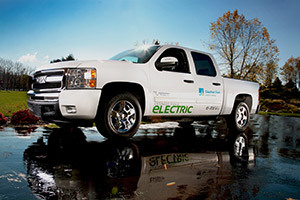 PG&E joined with the Edison Electric Institute (EEI) to urge utilities to more than double their current investments in electric utility fleet vehicles—a goal that represents an estimated $50 million of new investment in electric vehicles across the industry. PG&E and EEI called on companies to invest 5 percent of their total fleet investment, approximately $1 billion in total, starting in 2015. PG&E was ranked the top vocational fleet in the United States by FleetOwner Magazine’s 12th Annual Fleet of the Year Awards for demonstrating innovation and excellence in its fleet operations. Of the roughly 13,600 on-road vehicles we owned at the end of 2014, approximately 1,400 were electric-based, 500 were powered by CNG and 1,200 were fueled by biodiesel. Our network of charging stations is also growing. Last year we added more installations, bringing our total to more than 500 charge points at about 80 locations across our service area. We also maintain a network of 32 CNG facilities, 24 of which are open to customers. PG&E uses its expertise to help commercial customers take advantage of this relatively low-emitting, domestic alternative fuel in their own fleets. 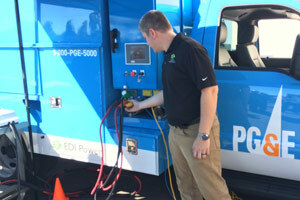 PG&E uses petroleum and biodiesel to power many of the vehicles in our fleet. The following chart shows PG&E’s fuel usage over the past three years. The use of natural gas in PG&E’s vehicle fleet, combined with usage in customers’ fleets, saved 2.5 million gallons of petroleum last year, which in turn avoided about 9,800 metric tons of CO2 in addition to other air emissions. 1 Prior year values have been updated to reflect PG&E’s natural gas fuel reporting to the California Air Resources Board (CARB) under the Low Carbon Fuel Standard (for customer vehicles) and the use of an improved methodology for calculating avoided emissions. At PG&E, we understand that fulfilling electric transportation’s potential requires a utility industry that’s an active partner in the transition to vehicle electrification. Moving forward, we will aggressively electrify our own fleet and add more of the innovative trucks we’ve helped to develop. We will also continue to innovate, invest and work closely with our industry, regulators, automakers and other partners to develop policies and best practices that will enable electric vehicles to flourish. This commitment includes our active engagement with EEI, which is part of a broad industry effort to accelerate the adoption of plug-in electric vehicles (PEVs) and technologies by utilities. EEI’s Transportation Electrification: Utility Fleets Leading the Charge (PDF) report offers a road map for a long-term, coordinated effort to further spur the development of electric vehicle technologies in the transportation market. The effort is led by EEI’s Electric Transportation Task Force, which is co-chaired by Tony Earley, Chairman of the Board, CEO and President of PG&E Corporation. We will also continue to promote CNG and LNG for heavy-duty truck and marine transportation.